The esophagus is a long, thin, and muscular tube that connects the pharynx (throat) to the stomach. It forms an important piece of the gastrointestinal tract and functions as the conduit for food and liquids that have been swallowed into the pharynx to reach the stomach. The esophagus is about 9-10 inches (25 centimeters) long and less than an inch (2 centimeters) in diameter when relaxed. It is located just posterior to the trachea in the neck and thoracic regions of the body and passes through the esophageal hiatus of the diaphragm on its way to the stomach. At the superior end of the esophagus is the upper esophageal sphincter that keeps the esophagus closed where it meets the pharynx. The upper esophageal sphincter opens only during the process of swallowing to permit food to pass into the esophagus. 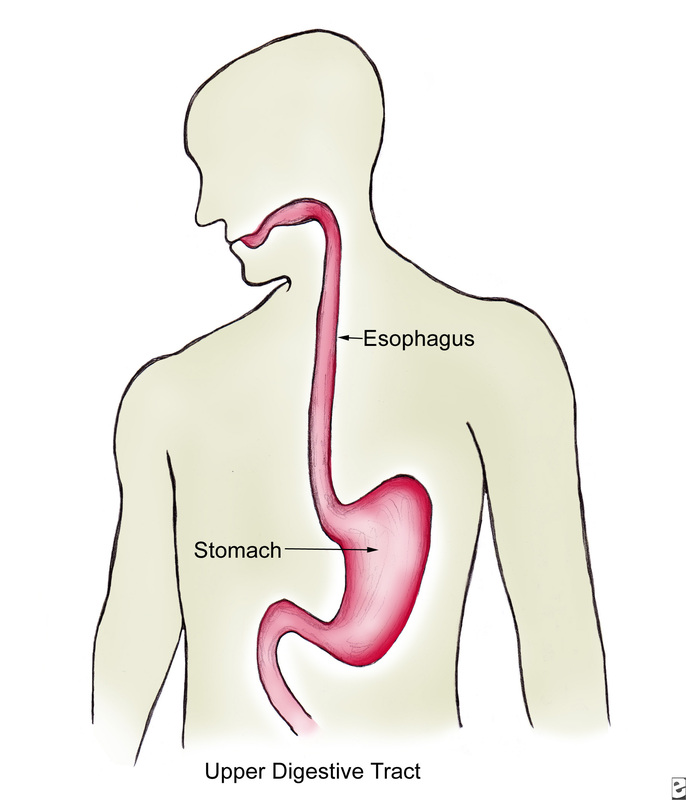 At the inferior end of the esophagus, the lower esophageal sphincter opens for the purpose of permitting food to pass from the esophagus into the stomach. 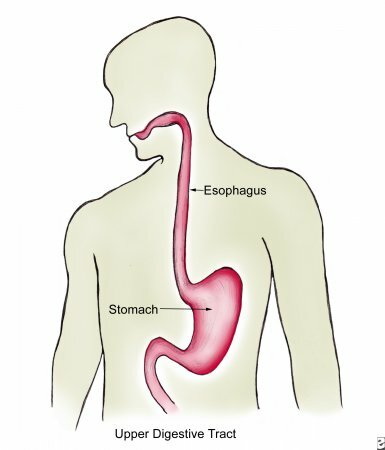 Stomach acid and chyme (partially digested food) is normally prevented from entering the esophagus, thanks to the lower esophageal sphincter. If this sphincter weakens, however, acidic chyme may return to the esophagus in a condition known as acid reflux. Acid reflux can cause damage to the esophageal lining and result in a burning sensation known as heartburn. If these symptoms occur with enough frequency, they are known as GERD (gastroesophageal reflux disease). Like the rest of the gastrointestinal tract, the esophagus is made of four distinct tissue layers. - The mucosa layer forms the inner lining of the esophagus and is the only tissue layer that has direct contact with substances passing through the esophagus. Non-keratinized stratified squamous epithelial tissue makes up the majority of the mucosa layer and provides protection to the esophagus from rough food particles and acid from the nearby stomach. Mucous glands in the mucosa produce mucus to lubricate the esophagus and help shield the mucosa from stomach acid. - Deep to the mucosa is the submucosa layer that contains connective tissue and provides blood and nerve supply to the mucosa and other tissues of the esophagus. - Surrounding the submucosa is the muscularis layer that allows the esophagus to contract and expand to move substances. Skeletal muscle is mostly found in the superior region of the esophagus to aid in the swallowing reflex while smooth muscle in the inferior esophagus pushes substances toward the stomach via peristalsis. - Finally, the adventitia layer forms an outer covering of loose connective tissue around the esophagus and attaches it loosely to the surrounding organs. The esophagus is involved in the processes of swallowing and peristalsis to move substances from the mouth to the stomach. The swallowing food begins in the mouth and continues with the contraction of skeletal muscles in the pharynx and esophagus. The upper esophageal sphincter dilates to permit the swallowed substance to enter the esophagus. From this point, waves of muscle contraction called peristalsis move food toward the stomach. In peristalsis, regions of the esophagus closer to the stomach open to permit food to pass through while the region just above the food contracts to push the food onward. Peristalsis works so well that food can be swallowed even while the body is lying down, upside down, or even in zero-gravity. A final function of the esophagus is its participation in the vomiting reflex to void the contents of the stomach. Peristalsis is reversed in the esophagus during vomiting to forcefully remove toxic or pathogen-laden food from the body.